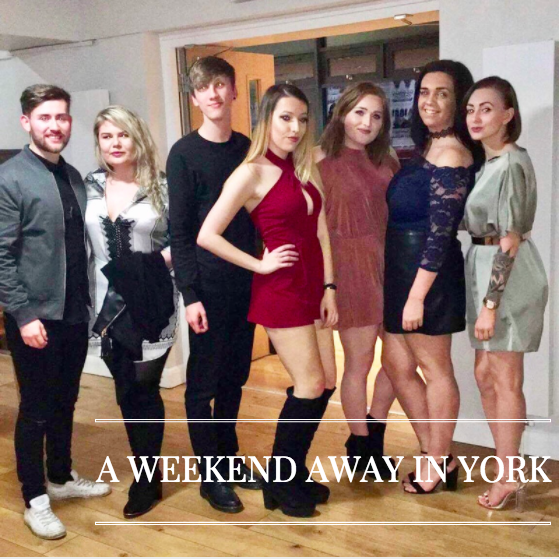 As I mentioned in my Hello 2017.... post I met an amazing group of people whilst getting placed for Americamp in Manchester, we got on so well that we decided to meet up again, this time in York. I thought I would share what we got up to whilst on our trip away, I also want to point out that I have added a travel section to my blog, so if you want to have a nosey at where I have been, it is now all in one place. I travelled down from Edinburgh and met Robyn at the station, we had lunch and then met the rest of the gang. We went for pizza and then got ready to go out. 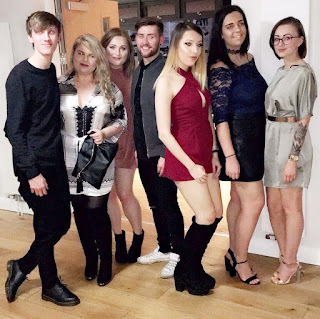 We went to All Bar One and then headed to Salvation nightclub, the cocktails and the atmosphere were amazing and it's safe to say we all had a good night! Not going to lie the next day I was slightly hungover and as I stupidly ate a piece of gluten, I was so ill, so the Saturday consisted of me walking around The Shambles doing a spot of shopping whilst the others went to the Dungeons! I bought a few bits and bobs that should feature in my posts in the next couple months! We decided to stay in that night and just chill, we played board games and Heads Up and just had a good laugh. Next day was all about The Shambles, I could have spent all day there, it has so many cute quirky shops as well as some well-known shops too. I absolutely loved the cobbled streets and the agriculture of the buildings. It felt like I was walking into the Harry Potter set, in fact, one of the shops has Harry Potter jewellery, as well as a few Harry Potter wanted signs outside, which gave it a special touch! I believe that Diagon alley inspiration was taken from The Shambles which is amazing! One of my favourite shops was The Imaginarium, It was this cute little shop that had so many unique adorable pieces (the animal heads below), I could have bought the whole shop if I had the money! We then got a few pictures at York Minister and then for brunch at a quirky pub/cafe, the pictures are on the wall where so interesting to look at! I never actually caught the name of the place it was super cute! I had one of the best weekends with some of my favourites people and York was just beautiful, I would love to go back for sure. Let me know if you have been? Have you got any recommendation on where to do for a nice weekend away? I am away to Copenhagen tomorrow so make sure to follow me on Snapchat and Instagram! I've only been to york once and loved it! Definitely want to go again and explore some more. Great post. This looks like you had so much fun! I love having little trips away with friends. Those shops looked so unique and quirky, I really like the look of what they had inside. Looks like so much fun! Especially all the board games hehe, love that sort of stuff! I absolutely love York, it's such a charming city with loads of things to see round every corner hi went for a day this summer and loved it! Totally agree with you about The Shambles, it's adorable and a must see place for everyone who visits the city! You and your friends look so smart and so happy in your pics as well, I'm so glad you had such a nice time! I've never been to York! We're looking at doing a mini romantic break somewhere just the two of us. So many places I don't know where I'd like to go, looks like you had a good time there. It's lovely to be surrounded by people who make us happy. York is only a short drive from me so we go fairly often. It's such a quaint town and I always find something quirky to buy there! Sounds like an amazing weekend! I haven't been to York since I was a child but I would love to go back, it looks gorgeous, and I really want to visit The Shambles!